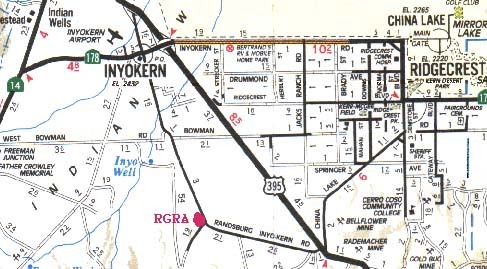 The Coso Archery Club Range is located within the RGRA (Ridgecrest Gun Range Association) located at the corner of Brown Road and Wiknich Roads, South of Inyokern, California (see map below). The Club moved to this location in March 2009. The club is enjoying the warm hospitality extended to them by the RGRA members. A lot of work has been accomplished since our move. The club started out basically with an area of desert flowers, sagebrush, and tumbleweeds. Club members have volunteered numerous hours getting the range set up for formal and informal archery events. The range now has features and facilities, as noted in the slide show. The public is invited to join us at our monthly shoots - which are held the second Saturday of the month: click here for the starting time of our shoots. The club also offers introductory archery instructions and can loan archery equipment on request. Most Tuesday's at 5:15 PM the Club has an informal shoot - come and join us - there will be plenty of shooting, bragging, and/or help adjusting your equipment. Range course consists of 14 targets, arranged in one loop. Course layout accommodates continuous full course shooting, or enables archers to safely enter and exit the range between loops. Trails and targets are well marked. Large burms provide a backstop. Range wildlife includes includes lizards, snakes, crows, and other desert birds and animals. Treat them well. Flat warm up area is great for "sighting in" and honing archery skills. Fixed shooting line for selected distances ranging from 10 to 60 yards. Spacious bow racks are provided which are friendly to compound and long bows. 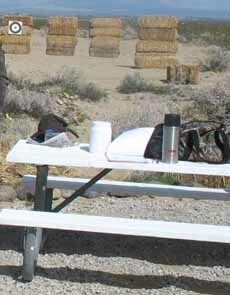 The area has a picnic table so you can enjoy a picnic break while on the range. There's a bow rack handy to stow your gear while you eat. The range is located at the corner of Brown and Wiknich Roads, southwest of Ridgecrest and south of Inyokern, CA.